To promote more efficient energy use, Meijer plans to change the interior lighting of all its stores to LED by 2021. The Grand Rapids, Mich.-based chain said the four-year project began last month at its 100-plus stores in Michigan. Plans call for other locations to be phased in state by state so they can remain open during the installation. Meijer operates more than 240 supercenters and grocery stores across Michigan, Ohio, Indiana, Illinois, Kentucky and Wisconsin. With the conversion to LED, Meijer said it expects to cut the electrical power use of its store lighting by as much as 50% annually. The LEDs — supplied by GE, Cooper and Phillips — will replace all in-store interior lighting, including ceiling and spotlight illumination. LED lights are 70% more efficient, improve lighting quality and last more than twice as long as traditional lighting, according to Meijer. 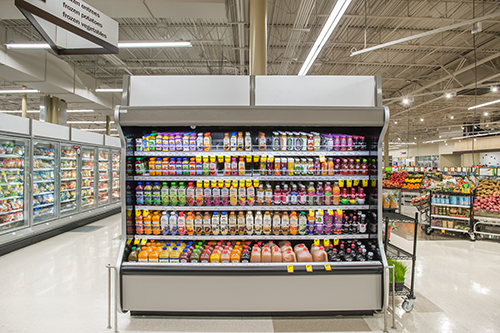 The company introduced its first all-LED store in Beavercreek, Ohio, in October 2015. "Our Beavercreek location served as a great test that led us down the path to planning a full-chain transition across our six-state footprint," said President and CEO Rick Keyes. "The lighting quality made possible by LEDs enhances the shopping experience for our customers and the work environment for team members while significantly decreasing energy usage." Meijer noted that, since 2005, it has lowered energy use in its stores by 25% per square foot. And since 2007, all stores have been built to Leadership in Energy and Environmental Design (LEED) standards. The company said it uses innovative and sustainable practices in store and supply chain operations, including the construction of energy-efficient buildings, a low-emissions truck fleet, and stocking a wide assortment of local and sustainable products in stores. Customers also have been a part of these efforts. In 2014, Meijer broadened its selection of energy-efficient light bulbs by partnering with GE Lighting to redesign and expand its retail lighting aisle. GE Lighting used the space to launch its new line of LED bulbs and worked with Meijer to educate consumers about LED technology as the industry phased out incandescent bulbs.